Have you ever heard the term, “Food before one is just for fun?” I call that baloney. Have you ever thought of the most nutrient dense foods you eat? Some may say baked salmon, fruits, vegetables and coconut oil. Yes! All of those foods are very nutrient dense. They have awesome fats for the nervous system (helps the brain work well! ), vitamins and minerals for beautiful skin and energy, and coconut oil is very satisfying and can even help your metabolism. So, now think about those first foods infants are usually fed…rice cereal, packaged fruits & vegetables, infant cookies & crackers (puffs) and maybe some fresh fruits. Rice Cereal is not that nutrient dense compared to salmon or coconut oil. Children prior to the age of 18 months actually cannot digest grains such as wheat, barley, oats and rice. They don’t have the digestive enzymes and their systems have not matured enough to break them down. So what is there to feed baby then? Letting baby lead the process of starting solids is the best way to encourage healthy eating behaviors. Some babies will start as early as 5 months or so or up to 10 months for their first foods. There are many soft and easy to mash up foods that are perfect for children up to age 2. For instance, the Weston A Price Foundation, a group that advocates nourishing traditional foods based on the work the dentist Weston A Price, suggests baby’s first foods should be egg yolks, liver, bone broth, butter, avocados, fish eggs, and fermented cod liver oil. These foods are easy to swallow and are chocked full of protein, fats, vitamins and minerals. These foods can be introduced at around 6 months old. Just lightly cook a whole egg in a skillet and grate some grass fed frozen liver into the egg yolk. Then just put some on a little baby spoon. You may be quite surprised how much your baby loves this food! Babies also love to eat mashed banana and avocado. At around 10 months or so, babies can be fed a variety of meats, fish, fruits, fermented dairy (if tolerated) and vegetables. Don’t forget to include healthy fats such as grass fed butter, coconut oil, olive oil, and other grass fed fats when cooking for baby. My son, now almost 3, had many digestive issues as an infant. After trying every commercial formula, we researched and found the infant formula recipe in the cookbook, Nourishing Traditions by Sally Fallon. We started giving it to him when he was about 5 months old. He loved it. Then at around 6 months we started with the liver and egg yolk. Some of his digestive issues started to return so we stopped the eggs in recommendations of his physician. However, we continued to feed him soft cooked sweet potatoes and other root vegetables blended with bone broth. He would practice feeding himself avocado, banana, soft pears, and even beef stew meat. His skin was beautiful and his sleep was finally settling out better at night. Honestly, I was surprised how easy it was to feed him a whole foods based diet. I saved a ton of time using my crockpot frequently to cook down many types of animal meats. By feeding your baby nutrient dense foods prior to age 1, you will encourage him to enjoy nutrient dense foods and develop a palate for vegetables and fruits. Plus, the whole family benefits from eating a whole foods based diet together. Remember that the main source of baby’s nutrition should come from breastmilk or formula before 1. Erin Donley M.Ed NTP is a Nutritional Therapist in private practice in Mechanicsburg PA. She has a passion for working with young families transitioning to a whole foods based diet, working with couples trying to achieve pregnancy, and running the RESTART group program for those looking for solid nutrition education and a sugar detox. Find more information on Facebook @ Faithandhopewellnessassociates and at www.faithandhopewellness.com. Normally, insulin, secreted continuously by the pancreas, acts like a key to open the door to cells in our muscles, liver and fat tissue so glucose can enter. When pregnant though, generally between the second and third trimester, the mother’s insulin requirement increases by 2 to 3 times above normal levels. (1) Also during pregnancy, the placenta produces hormones that help the baby grow and develop. These hormones however make cells less responsive to insulin. Consequently, during pregnancy, the mother’s body needs to produce higher amounts of insulin to keep her blood glucose levels within the normal range. Typically this would not be a problem and the pancreas would secrete more insulin to lower the blood glucose levels. It’s when the pancreas cannot produce enough insulin to control blood glucose levels that glucose intolerance develops. When this happens during pregnancy it is called Gestational Diabetes Mellitus (GDM). After the baby is born, the mother’s blood glucose levels usually return to normal. It is estimated that Gestational Diabetes affects 18% of pregnancies (2) based on new diagnostic criteria developed in 2015 by the International Association of Diabetes in Pregnancy Study Group and the American Diabetes Association, with it’s prevalence increasing worldwide. GDM usually has no obvious symptoms, therefore diagnosis is typically made through an oral glucose challenge screening between 24 to 28 weeks of pregnancy. (3) If a woman tests positive during this screening test, a second test, called the Glucose Tolerance Test (or the 3-hour challenge), may be performed. This test will diagnose whether diabetes exists or not by indicating whether or not the body is using glucose effectively. (4) This screening recommendation has been upheld by the US Preventative Service Task Force as of January 2014. Some sources question testing procedures, from the ingredients in Glucola, the sugary drink you consume when tested, to controversy about screening and the effectiveness of treatment. Those noted with an asterisk (*) are lifestyle related risk factors that are modifiable. When risks are combined there is a greater chance of developing GDM. The management of GDM aims to mediate the effects of hyperglycemia by controlling blood glucose levels to improve pregnancy outcomes. Likely your doctor will begin by asking you to modify your diet and begin an exercise regime. Exercise has a powerful potential to assist with blood glucose control. In fact, exercise has been shown effective in preventing, reducing or even delaying the need for insulin management. If adequate glucose levels are not achieved with diet and exercise alone, a woman will generally be directed to anti-diabetic medications to reduce blood glucose levels for mother and baby. Records as early as the 17th and 18th Centuries have shown encouragement of exercise during pregnancy as it was thought to ensure good health and prevent miscarriage (11). Modern research shows that this is not far from the truth. Despite a trend in the last century which encouraged women not to exercise during pregnancy, current trends show that it is increasingly recognized as safe in low-risk pregnancies and is encouraged as part of routine prenatal care. Physical activity during pregnancy may prevent both GDM and possibly later-onset Type 2 Diabetes. (12) Studies even show that regular physical activity prior to becoming pregnant has shown a reduced risk of developing GDM. (13) In fact, women with a higher risk for GDM may even be able to prevent it by managing those four modifiable lifestyle risk factors noted above with an asterisk. Diet and regular physical activity are frequently sufficient to manage hyperglycemia. The general recommendation if beginning a new yoga practice during pregnancy is to wait until the 2nd trimester to begin. This may be especially appropriate for women who were previously sedentary, waiting until after the initial discomforts of morning sickness, nausea and fatigue have settled down. Since exercise in early pregnancy can reduce the risk of GDM, the sooner you feel up to exercising comfortably, the better. If you have a regular practice, continuing through the first trimester is fine as long as you are listening to your body. You’re growing a whole new human being which can deplete your energy and vitality, so rest when you’re tired. Yoga has always been about being in the moment and you may find that pregnancy pulls you deeper into the here and now as you move along with the daily changes happening in your body. While no one yoga pose will help to prevent or alleviate gestational diabetes, practicing this flow of beneficial poses* on a regular basis as a recommended portion of a regular exercise routine may help to lower stress and regulate blood sugar levels. Contraindications: If any of the following warning signs occur, it is advised that exercise should be terminated: vaginal bleeding, dizziness, headache, chest pain, muscle weakness, preterm labour, decreased foetal movement, amniotic fluid leakage, calf pain or swelling and dyspnoea without exertion. (19) Additional contraindications are listed here. Hot yoga should also be avoided during pregnancy. Be sure to check out Om Baby’s Prenatal Yoga schedule and join us for a class to help reap the many benefits of yoga during pregnancy. Modifications and adjustments available for all stages of pregnancy. (16) McCall, MD, Timothy. Yoga as Medicine: the Yogic Prescription for Health and Healing, p. 283. (17) McCall, MD, Timothy. Yoga as Medicine: the Yogic Prescription for Health and Healing, p. 283. Holly Keich is the owner of Om Baby Pregnancy & Parenting Center in Camp Hill, PA. She began her yoga journey at Be Fit Yoga Studio with Bobbi Misiti in 2002. She began teaching Ashtanga at Be Fit in fall of 2004. 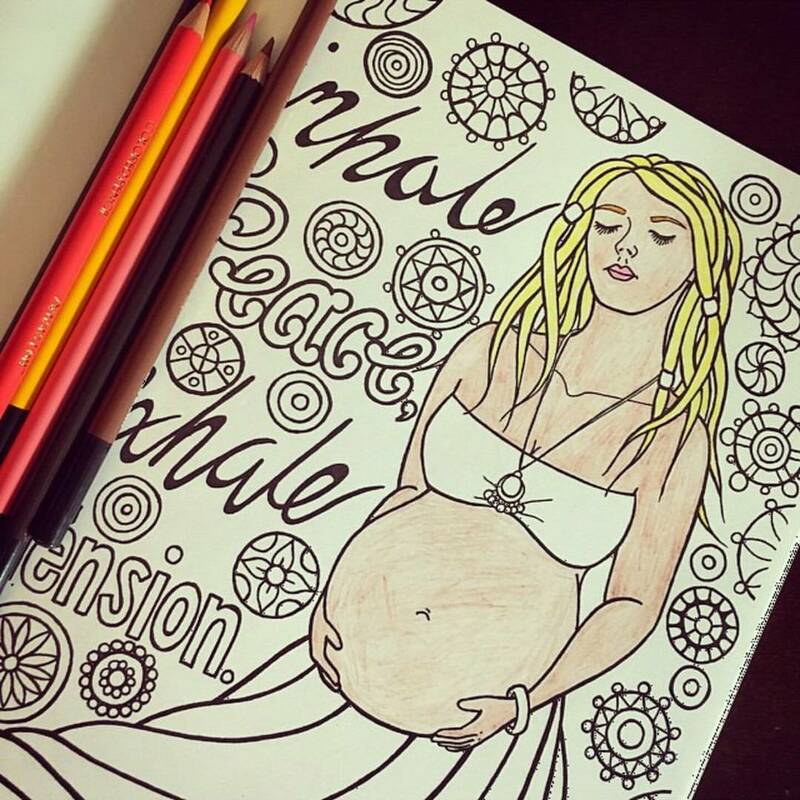 In 2007, when Holly became pregnant with her first child she began teaching prenatal yoga classes that impart not only the wisdom of poses for the childbearing year, but also knowledge of the spiritual and emotional process of becoming a parent. Holly has attended pre and postnatal yoga teacher trainings with Stephanie Keach and Mindful Mamas. She has also attended Baby Om Yoga training in NYC and is a Certified ChildLight Yoga Instructor, including Baby & Toddler Yoga as well as a Certified Infant Massage Instructor. More recently she has become a Certified Sacred Pregnancy Instructor. She continues to develop her support of mother, child & family connections through the opening of Om Baby Pregnancy & Parenting Center in 2008. Once a woman becomes a mother, everything changes. The transition for both mother and child can be a demanding one, requiring physical, emotional and spiritual strength that you had not previously encountered. Turning to a relaxing and nurturing yoga practice can help you find peace in your new role as a parent. The physical poses help you regain strength and flexibility in your life while taking a meditative approach to practice can help you find the calm within, allowing you to be more at peace. With a soothing, yet invigorating practice, you may find yourself feeling more centered and floating out of the studio at the end of class. This feeling is sure to flow into your daily interactions with your baby and family. As a new mom though, when do you have the time to take for yourself? You may think that taking care of yourself and your baby are mutually exclusive activities. But you might want to consider practicing yoga with your baby. In fact the definition of “yoga” means “union”. In a traditional practice, this means linking and unifying the mind, body, spirit. But in baby yoga, it includes developing a union or bond between you and your baby as well. Being with your baby in the present moment, easing expectations of how things ought to be and enjoying what is can create more happiness in your life and help you find more peace and joy as a mother. Unlike the viral You Tube video, baby yoga is a gentle, mindful practice between a parent and caregiver that involves stretching, massage and relaxation. Classes incorporate a mix of asanas (poses) for new moms with movements for baby that help develop their gross and fine motor skills, improve sleep patterns, aid in digestion and help babies explore their new environment. Infant massage is often incorporated into classes building trust and communication between the baby and caregiver. Movements, poses, rhymes and songs are repeated through a series of classes which encourage you to continue the practice at home or even on the go to help soothe your little one. to get a different perspective of their world. The bonds that you’ve developed in baby yoga don’t need to end when your child becomes mobile. Practicing yoga alongside your growing child, you will see them develop more coordination, strength and self-confidence. Whether they use you as a jungle gym as you develop your own home practice or choose to attend a class at Om Baby Pregnancy & Parenting Center, you’ll find that toddler’s delight in this special activity with Mom or Dad. Classes at this stage look less like your traditional yoga practice in order to keep up with the boundless energy of toddlers. You’ll find us moving, singing, breathing, and using our imaginations as we weave yoga poses into a fun and interactive story. Children have the freedom to utilize the whole room as their yoga mat which increases social interaction between classmates. Class becomes more active, but is still balanced with relaxation and mindfulness. You may even find your little yogi spontaneously practicing their favorite poses at home. Or you may find poses that you can utilize to help calm your child in challenging moments. Sharing yoga with your child can have a lasting impact in many ways. Whether bolstering neuromuscular development, providing opportunities for healthy social-emotional development to laying a foundation for life-long fitness and healthy lifestyle for your child, baby and toddler yoga is sure to create memorable moments in your life while reducing the stress and anxiety that comes with parenting. Holly Keich supports mother, child and family connections through her business, Om Baby Pregnancy & Parenting Center, in Camp Hill. She is a Prenatal, Baby, Toddler & Child Yoga Instructor, Certified Infant Massage Instructor and Licensed Social Worker. 717-761-4975 www.ombabycenter.com. Check out Om Baby’s Schedule for upcoming classes in yoga, art, dance, music, baby signing & more! When considering cloth, the most daunting aspect of cloth diapers seems to be the idea of laundering them. Do dirty diapers really go into the washing machine, the same one that washes all the other clothes for my family? Will I have the time and energy to do the laundry when caring for a baby? Isn’t it complicated? Laundering cloth is much more simple than most people realize and considering that there isn’t a cloth diaper service in South Central PA, the washing machine is something you will become familiar with if you plan to cloth diaper. We’ll not only review the simple 5 Steps to Laundering Cloth Diapers as presented by the Real Diaper Association, but also the why’s behind them. Consider it your primer for evidence-based cloth diaper washing that will give you the best possible chance at succeeding with cloth diapers. 1. Dump Dump solid material into the toilet. Put diapers in (dry) pail until wash time. Here’s the science: Exclusively breastfed baby waste is water soluble so will be removed in the initial rinse cycle. Solid or formula-fed baby waste should be dumped first. This prevents human waste from leaching into water sheds and is actually something all parents should do regardless of type of diaper they use. It’s safer not to leave a wet pail around the home with toddlers. That said, if you’re okay with the safety issue, it doesn’t hurt to soak, it’s just not necessary if all else is working okay with your process. 2. Rinse Optimally run your load once you can mostly fill, but not overstuff, your washer. Rinse diapers in warm water. Here’s the science: Most people have success washing every 2 or 3 days, washing 12-24 diapers at a time. It depends, though, on the size of your washer. Too full a load is not good (inadequate access to water and detergent); too empty a load not good (too much space prevents sufficient agitation). Soil is most easily removed at the temperature it was added at. Waste comes out at approximately body temperature, which is approximately what temperature “war” water is in a washing machine. 3. Wash Wash diapers with detergent in hot water. Detergent should be fragrance and color-free with no optical brighteners or fabric softeners. Use additional detergent if you have hard water. Use enough detergent to clean a load of dirty laundry but not too much. Here’s the science: You’re looking for a detergent that is clean-rinsing and won’t leave and residues on your diapers. You also want it to be safe for your baby’s skin. Pinstripes and Polka Dots has a detergent chart that will help you assess what detergents are best choice for washing your diapers. 4. Rinse Rinse diapers in warm water. Rinse again in warm water. Here’s the science: Most wash cycles will end with a rinse, so you can set the machine for an extra rinse. This increases the amount of water, which is particularly useful in cleaning natural fibers like cotton and help. It will also be sure to rinse out any remaining detergent to prevent buildup. Warm water will release residues more effectively and will release more water from the fabric in the spin cycle, shortening drying time. 5. Dry Thoroughly dry diapers in the sun or in your automatic dryer. The sun will save energy and bleach out stains. If you use a dryer, use the lowest temperature that successfully dries your diapers. Here’s the science: If you use a dryer, use the lowest temperature that successfully dries your diapers. Drying at high temps reduces the life of any fabric or component. Even More Science: There are five factors that work together in laundry. Water, Agitation, Time, Chemical & Heat, known as the WATCH Formula. Water– Water does a good portion of your cleaning. You may need to make adjustments to make up for poor water quality. Water plays a large role in cleaning cotton and hemp. Agitation– Mechanical action (rubbing together in a top loader, “the fall: in in a front loader) simulates hand scrubbing. Time– Length of cycles (and/or soaking) affects cleaning. Chemicals– (clean rinsing) detergent is especially necessary in cleaning artificial materials, which are oil-loving and bond with the oils and fats in human waste. Heat– While most home laundry machines can’t get water hot enough for long enough to kill organisms, higher heat helps the other components do their parts. example), you need to increase the other factors to clean your diapers successfully. The Real Diaper Association offers this excellent chart that demonstrates the changes and where you need to adjust. In the example given above, you will need to increase the water and time if you reduce heat in the wash cycle. If using a energy efficient washer that uses less water, you will need to increase time and agitation in the cycle. The RDA cloth diaper washing instructions assume a mixture of fabric types. For better results, separate fabrics. If you are having trouble with your diapers, consult the manufacturer. Information provided by the Real Diaper Association and scientists in the industry. More info at realdiapers.org/laundry-science.